There are also a lot of discussions about whether or not Gene Roddenberry was Jewish that I chose not to bother linking to -- because no, he was not. End of debate. His family was Southern Baptist and he himself was a secular humanist, as clearly stated in his official biography, Star Trek Creator. I do not know how the rumor that he was Jewish got started (based on his name maybe?) but it is not true. Since the new movies came out, there have been several Jewish Trek articles discussing whether the Jewish subtexts of the old universe are going to get lost in the re-boot. Because Zachary Quinto (the new Spock) is not Jewish, it is possible the character will go in a different direction from Nimoy's portrayal. On this page I have tried to present the best of what I found in Jewish Trek articles, without too much duplication. If you know a site you think I should include, please give me the URL in the comments section below. 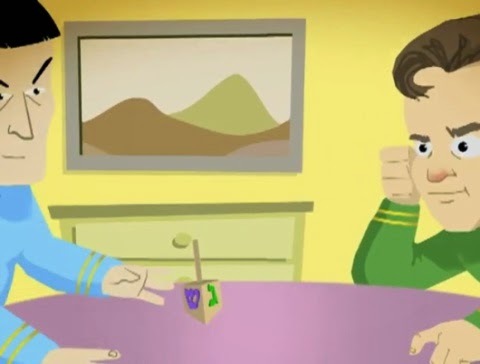 Video: The Hanukkah Song" on YouTube is a Neil Diamond video version of Adam Sandler's "The Hanukkah Song," with the classic lyrics "cause you can spin a dreydel with Captain Kirk and Mr. Spock -- both Jewish." Well, the original actors both are, but not the Trek characters. Still, it's a cool song designed for Jewish kids (and adults) who feel overwhelmed by all the Christmas hype. Read all the lyrics here. Happy Hanukkah from Trekmovie.com has an interesting discussion of non-canonical references to Hanukkah in fan-generated Trek, including a funky Trek menorah made from Pez dispensers! Volkswagen Taps Jewish Star Trek stars -- The Schmooze, Septeember 30, 2014. For decades now, Jews have boycotted German cars because of the Holocaust. In the past, Volkswagen has generously contributed to Jewish charities. Now they seek to shed the stigma by hiring William Shatner and Leonard Nimoy to star in the ad campaign launching their first electric car, the e-Golf. Star Trek XI: A Vulcan Holocaust? My 2009 essay from the old website (and also included in my book Jewish Themes in Star Trek) about parallels between the Nazi Holocaust and the destruction of Vulcan by Nero in the new timeline. Also explored are possible parallels between the historical impact of genocide on the Jewish community and what might happen to the culture of the remaining Vulcans in the new timeline. Pure speculation but some interesting questions are raised. The Ten Commandments in Star Trek Paul Asay on BeliefNet, posted October 19, 2009. A very nice article that pairs each of the Ten Commandments with a Trek episode that illustrates that particular commandment. Good resource for Bible/Torah study classes, or just plain fun to read! Star Trek, The Star Trekker Rebbe, and a Question of Destiny by Dodi-Lee Hecht presents a review of the new movie, stories about her father, Rabbi Ben Hecht -- known as the Star Trekker Rebbe -- who weaves Trek lore into his sermons, and an interesting idea: Founding the Starfleet Yeshiva, where people will write Jewish lessons based on various episodes! Jew Trek is a blog essay on Jewcy.com, by Mordechai Shinefeld. He discusses the Jewishness of the classic Vulcans (among other things) and the apparent lack thereof in the new movie's portrayal of Spock and other original characters. Will the Jewish subtexts be lost in the new timeline? Video: The Origin of Spock's Greeting -- straight from the horse's mouth, as they say. An 8+ minute clip on YouTube of Nimoy discussing Jewishness in Star Trek, his childhood alienation as an "outsider" because he was Jewish, how that relates to developing the Spock character -- and of course, the origin of the Vulcan salute. He tell the story in considerable detail as to how it came about on the set. He then puts on a prayer shawl and demonstrates the kohane blessing ritual. Of special interest is the very animated (and Jewish!) way he speaks when not playing Spock. Top 5 Jewish Moments in Star Trek by "Geekheeb." 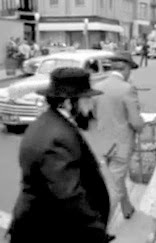 A nice blog page with video clips from various episodes featuring Jewish characters or themes: (1) In "Far Beyond the Stars" (DS9), two Orthodox Jews (see pic on the left <<----) walk past a newspaper stand and Armin Shimerman plays a Jewish writer in the 1950s; (2) Data plays poker with Einstein; (3) Nimoy explains the Vulcan Salute (same clip as linked above); (4) the remastered trailer from "Patterns of Force" (TOS Nazi episode); and (5) Worf's Jewish parents. Plus a funny Jewish clip from "Frasier" where a bar mitzvah blessing is read in KLINGON! JUF Tweens: Star Trek is a page from the Jewish United Fund (JUF) of Chicago, specifically aimed at Jewish tweens. It gives a nice rundown of Jewish actors and charcters in various Star Trek series & movies. An easy-to-read introduction to Trek for the younger generation. Star Trek: Social Revolution and Jewish Thought -- Matthue Roth of MyJewishLearning.com imagines a dream-team synagogue made up of movie and TV characters. Kirk as chazzan? Spock as rabbi? A fun romp where you learn, among other things, that Shatner celebrates Shabbat (Sabbath) dinner with his family on Friday nights. However, there is a typo where Roddenberry supposedly gave an interview in 1994 -- unless it was a seance, that's impossible, but we'll blame it on the Universal Translator. Wolfish musings: Orthodox Jews and Ferengi: Two of a Kind? is a blog essay by a writer who goes by "The Wolf" which expresses the opinion that the Ferengi are based on Orthodox Jews. I have found this opinion multiple times online, but this essay explains it best for the layperson -- even though I do NOT agree with his very nasty opinion of Orthodox Jews, which he bases on the Satmar community. Satmar is probably the most extreme Hasidic group, but they are certainly not representative of all Orthodox Jews. (I myself am Orthodox, FYI.) And "The Wolf" is WRONG in suggesting that the writers who created the Ferengi were Orthodox Jews -- not by a long shot. As far as I know, Ira Stever Behr (who wrote a lot of the Ferengi episodes) is a secular Jew. Armin Shimerman, who plays Quark, is not Orthodox, either. So, if the Ferengi were intended to slam Orthodox Jews, then it is more like the anti-Orthodox secularists attacking and ridiculing the Orthodox from the outside (and in much ignorance) -- the kind of anti-religion stuff that Roddenberry so loved. Read this article to understand a common secularist POV but don't take it too much to heart. Then go buy my own book, Jewish Themes in Star Trek, and read the chapter "Ferengis are us?" Bennett on Jewish Roots and Trek Transformation (Trek Today, posted November 12, 2006 by "Michelle"). A summary of a talk by Harve Bennett to an Israeli fan group, revealing, among other things, that Harve Bennett was born Chaim Fishman (yes, he is Jewish.) He talked about screening Star Trek VI in Tel Aviv and Moscow, and the influence of his Jewish upbringing on his contributions to Trek. Bimah Me Up, Scotty! from the Arts section of The Jewish Journal of Greater Los Angeles discusses a performance of the Chanukkah story that Leonard Nimoy narrated for the Western Wind Vocal Ensemble on December 14, 2004. And of course, Nimoy also discusses the origins of the Vulcan salute. (For those who are not Jewish, "Bimah Me Up" is not bad Italian, it's a pun on Hebrew. a bimah is a synagogue pulpit.) You can buy a CD of an earlier 2002 performance of this program with Nimoy and the Wind Ensemble, Chanukkah in Story and Song on Amazon.com. The Sum of His Parts: A good word about the evil inclination by David Holzel explores the TOS episode, "The Enemy Within" in light of Jewish teachings about the yetzer ha-ra (evil inclination) and the yetzer tov (good inclination), and how we need BOTH to be complete beings. At last, a Star Trek character admits she's Jewish... is Rabbi Gershom's Amazon review of the Trek novel Well of Souls, which features a Jewish character, Darya Bat-Levi. In this review, he analyzes the accuracy (?) of her ideas about Jewish theology and the afterlife as presented in a four-page section of the book. Star Trek novels with (maybe) Jewish characters is a Listmania list on Amazon.com, created by Rabbi Gershom. Each listing has a short comment identifying the Jew(s) in the novel. Human Names in Star Trek lists all the last names of Human Trek characters so far, with the complaint that the vast majority are British/Irish and that this does not reflect the population of Earth. However, the compiler mis-guessed "Kaplan," which he classifies as "uncertain origin" when I know darned well that Kaplan is a Jewish name! Green can also be a Jewish name -- for example Arthur Green, a major Jewish theologian. Not to mention that David Ben-Gurion's last name was originally Green. Still, it's a good place to guess who might be Jewish. He said, She said: The search for God on Star Trek by Steve Johnson and Michelle Erica Green is a sort of dialogue betwen two writers about the lack of any religious references in much of science fiction (Star Trek included), the pervasiveness of cultural stereotypes when Jews and Catholics are portrayed anywhere on TV, etc. A bit of a rant in places, but well worth reading. And, yes, Ms. Green is Jewish (see my comment about names in the entry above this one). Religion in Star Trek is a page with a list of religious references -- alien and Human -- in Trek episodes. As complete as I found anywhere on the Net -- good job! Disappointingly, Jewishsf.com is not a science fiction site. (sigh) The SF in their domain name stands for San Francisco. It's a general Jewish site that may have occasional SF articles (which is how I found it in a Google search). You can search their archives.